Deli Stationery is a China professional office supply manufacturer. We are able to provide a variety of office supplies such as stapler, desktop set, paper cutter, pencil sharpener, etc. This is our desk management system, you can find other similar products of different functions by clicking the below icons. Welcome you to browse and choose! 1. Features: Absorbed advanced design philosophy form European countries. 2. Beautiful appearance: Our desk management system is neat, fashionable, and has bright colors. 3. Functions: Help to improve your working efficiency and decorate your office. 4. Advantages: Strict quality control system is adopted and our desk management system is conforming to national and industrial standards. 5. We can supply a wide range of desk management system to satisfy different needs. 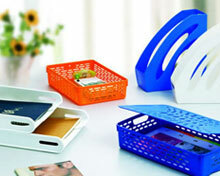 It is used to organize or classify different office equipments or files. Deli Stationery, an office supply manufacturer, can provide you a wide range of stationeries. Finger Wetted ToolMany people often lick their fingers and then count money. This is because wetted fingers can count money more quickly and easily. However, this is not a good method because this may cause some health problems.